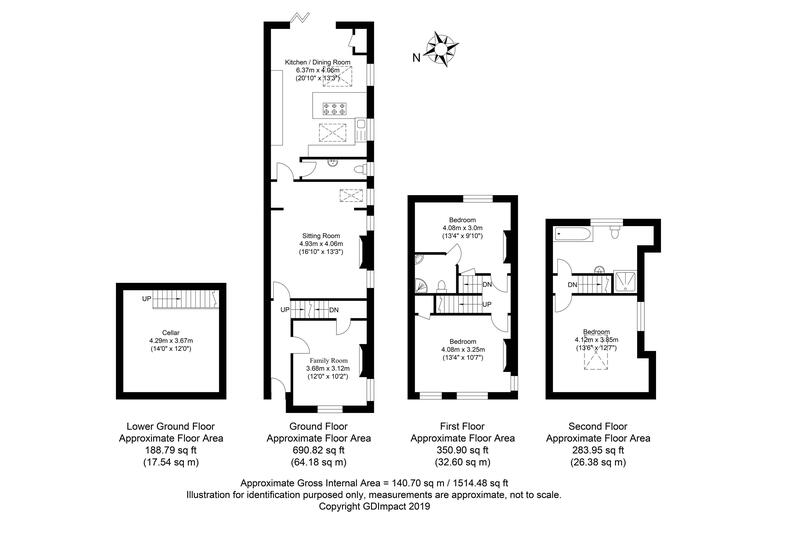 An outstanding and spacious 3 double bedroom, 2 reception room, 3 storey Victorian semi detached house of 1,514 sq ft, superbly improved and sympathetically enlarged with a private driveway for 3 vehicles, 14’ x 12’ cellar and private 52’ garden. The property is situated on a popular residential one way road, within easy access of the railway station, excellent schools, town centre and Horsham park. The accommodation comprises: entrance hallway, study/family room with access into the 14’ x 12’ cellar, sitting room with wood burner, inner hallway, cloakroom and a superb kitchen/dining room refitted with a beautiful selection of units with integrated appliances and bi fold doors onto the private garden. On the first floor there is a guest bedroom with en suite shower room and a further double bedroom. On the top floor there is an additional double bedroom and family bathroom with separate shower enclosure. Benefits include double glazed windows, under-floor heating to the kitchen/dining room and cloakroom and gas fired central heating to radiators (boiler located in the kitchen/dining room). A private driveway provides parking for 3 vehicles. The 52’ x 23’ part walled east facing garden is a particular feature of the property and offers an excellent degree of privacy. The garden is predominantly lawned with well stocked borders and a patio. The property is situated on a popular residential one way road, within easy access of the railway station, excellent schools, town centre and Horsham park. The vibrant town of Horsham offers residents and visitors a cultural mix of heritage and state-of-the-art attractions. At its heart, the bustling Carfax is alive with regular markets, bandstand entertainment and an assortment of enticing shops. Nearby you can find the serenity of the Causeway, home to the historical museum, art gallery and treasure trove of 17th century properties. Around the corner, Horsham’s multi-million pound transformation of Piries Place accommodates a contemporary Everyman cinema, reputable Brasserie White Company and impressive high-quality shopping. Familiar high-street and independent retailers can be found in the convenient Swan Walk centre. Fine-dining and 5* spa hotels, pubs, delicatessen, bakeries, ample parking facilities and a choice of supermarkets are at hand in and around Horsham, serving the lifestyle needs of the whole family. Horsham has an exceptional choice of schools in the area, with high Ofsted ratings and Collyer’s college is a short walk from the town centre. Community facilities are in abundance with a well-stocked library and an array of leisure activities including rugby, football, cricket, gymnastics, dance and martial arts. Golfers have a choice of local courses and driving range, and Horsham joggers have a welcoming club. For family fun, Horsham Park has significant attractions with a wildlife pond, swimming pools, tennis courts, café, aerial adventure, seasonal events and nature gardens. The Downs Link offers inviting opportunities for scenic family walks and keen cyclists. Royal Sun Alliance are a notable employer in the area and as a commuter town serving London, Gatwick and the South Coast, there are direct train links to all central and rural locations. This would be ideal if you are looking for a beautifully presented period home with a private driveway for 3 vehicles, 14’ x 12’ cellar and private garden.